Digital Projects are a great way to help learners achieve core 21st century learning competencies. Just what should you consider before planning on utilizing a digital project in your classroom? Class Outcomes: Individual and group “take-aways,” impacts on classroom atmosphere and future benefits of the digital project. Curricular Outcomes: The new curriculum makes digital projects a perfect way to incorporate key competencies into student learning. 1. What benefits should students derive from this project? 2. What types of skills and abilities are most important to achieve? 3. What degree of challenge should the “digital” element of this project impose upon students? I made this SWAY with both inspiration (for educators) and practicality (for the real classroom) in mind for those teachers/schools who are looking into furthering their use of technology. Be it elementary, middle or secondary, it is difficult sometimes to step back and look at the integration of technology into our classrooms from a practical (and realistic) perspective. In the last few years, technology in education has been a passion of mine, especially when its comes to educating teachers on its use in the classroom. I went to an amazing Microsoft conference this past weekend, and by the end of the last session, just after the group photo, I realized that I could no longer call myself a “Mac person.” This self-labelled title has been a big part of who I am as an educator for a number of years; I now have a good reason to toss the title aside: the greater good of education. Both Apple and Microsoft (and other companies) have teams dedicated to making their products work for education, but when we choose to stick to just one or the other it becomes a detriment to our students. This weekend really opened my eyes to an entirely different world of applications, hardware and learning tools for a variety of learners. Obviously, I’m not in purchasing, nor in a position that allows me to make those “big decisions” for my school, or my district; however, I want to call upon those who are to really think about the tools they’ve chosen for our students. Did they choose iPads because of the prestige of being labelled an “Apple District?” Do some of our schools run Chromebooks because of the cost? Are COWS made up of $1000 Macbooks an effective way to get technology into elementary classrooms? How “long-lasting” are basic PC’s? How many students will this technology impact? Can this technology be used by kindergarten students as easily as Grade 7’s? Can Biology 12 students utilize it just as much as English 8 students? Is it just for main stream users, or can it be modified or used for those students with learning support needs? 2. How versatile is this technology? It is great for just research? 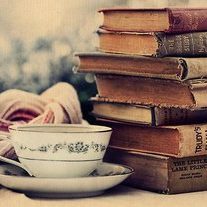 Can it be used a reader and scribe? How easy it is for students to submit work electronically? Can they print with it? Does it multiple controls (mouse, keyboard, stylus)? How much software does it require to be multi-functional? How expensive is extra software or programs? 3. Does the price point match the answers to the above questions? Does it make sense to purchase only a few per classroom, or it is more effective to purchase based on a one-to-one application (class sets)? Can we afford enough of this technology to make it worthwhile for learning? Is this product a novelty or long-lasting technology? I hope that I can at least start the conversation surrounding technology purchases and the opportunities available for those willing to let go of the “Mac vs. PC” dichotomy. In the long run it shouldn’t be about labels, it should be about learning. 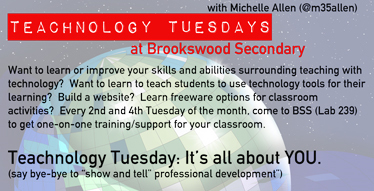 Disguises…are you REALLY a “Technology Teacher”? This post might stir up some negative feelings, but please don’t take it as a swipe at your use of or your enthusiasm regarding technology in your classroom. 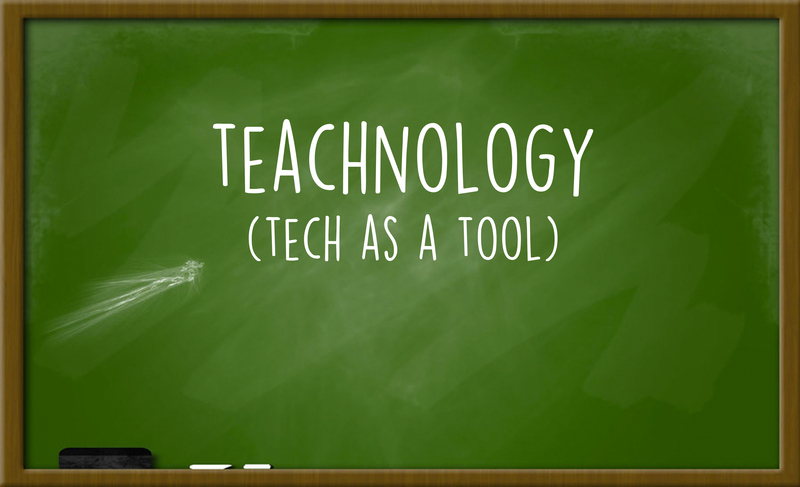 It seems everyone is labeling themselves “technology teachers” these days. I take issue with that for a number of reasons, but first and foremost: the title of “technology teacher” belongs to those who have the actual trained specialist designation of technology teacher; those who teach woodwork, drafting, metal works, etc. These secondary school teachable subjects have been called “the technologies” for quite some time now…give these guys a break! Don’t steal their entitled titles. Semantics, you must be grumbling to yourself. Of course, you’ve already registered an awesome technology Twitter handle or started a fun blog with alliterations. Perhaps you weren’t aware that this teachable fell under the title of “technology.” Well, consider yourself in the know (and pass it along): you are not technically a technology teacher, unless you teach the aforementioned classes. For me, as a computer sciences teacher, I (of all people) should be first in line to label myself as a “technology teacher;” however, I don’t want the title. I am a computer science teacher. I love that I am a computer science teacher. I trained to be one, I love to tell people about my job. I love to explain what I teach (digital media, yearbook, interior design, programming). My position includes teaching and using technology, but my position is more than just the computers I have in my classroom. Everyone, everywhere uses technology in their classroom to some degree. It’s 2015, after all. It doesn’t necessarily make you stand out (if that was your intention). You should be proud to be a Grade 6 teacher, an English teacher, a French Immersion teacher. You teach something special already, something unique and exciting to your students. People want to know what you teach, as well as how your teach it. Your tool isn’t your title. You don’t teach technology, you teach with technology. The difference is important. It isn’t just semantics. Don’t sell yourself short with a disguise. What you teach is important, technology should be secondary. Let’s all be teachnology teachers instead.